In the refining and petrochemical industry cooling water plays an integral part in operations. Without cooling water systems, many of the required processes are impossible. Last to be taken offline during shutdowns and first to be restarted during start-ups, cooling water systems are one of the most critical systems containing a non-toxic, non-flammable, non-hazardous fluid: water. However, any threat to the mechanical integrity of this system can lead to plant downtime, lost production, and significant maintenance costs. Therefore, proper inspection, maintenance and operation of cooling water systems are critical. Different sources of cooling water are used in facilities, such as sea water, fresh water canals, well-water, etc. The source of the water is usually a product of the where the facility is situated. However, depending on the source, the corrosivity of cooling water differs. The handling and treatment of cooling water can also have an impact on its corrosive nature. Operating practices is another factor which directly affects erosion issues related to cooling water, especially where valves are throttled and velocities are not maintained. In this brief article, corrosion in cooling systems, which use sea water will be the focus. 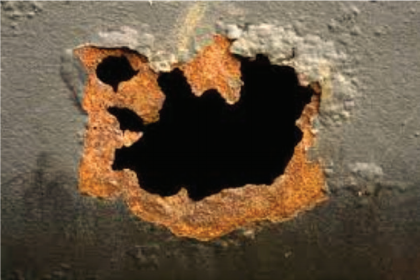 Sea water corrosion and erosion issues can affect almost all commonly used metallurgy in a refinery or petrochemical plant, starting from carbon steel, low alloy steel, all grades of stainless steel, copper, aluminum, titanium and nickel-based alloys. Metallurgical and material solutions to resist sea cooling water corrosion will be discussed later in detail; however operational controls to mitigate corrosion in sea water cooling systems are not addressed in this article. Figure 1. Sea water corrosion leak. What causes corrosion in sea water? Nice article, but I would argue that bacteria are... Log in or register to read the rest of this comment. How to evaluation the cathode protection and... Log in or register to read the rest of this comment. What about to use the FRP or GRP materials for... Log in or register to read the rest of this comment.